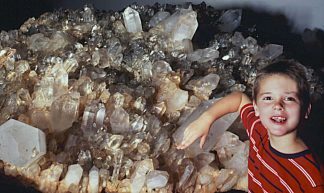 Weighing over 8,000 pounds (about 3,800 kilograms), this is the largest Arkansas quartz mega-cluster ever discovered from the world’s finest quartz mine. This vein of quartz was discovered in 1988 in the formerly abandoned crystal mine. A quartz-lined tunnel, 35 feet long, ended in a cavern with this giant gemstone in the middle of the space. Most of the crystals on this mountainous gemstone are ice clear or water clear. There is a sparkling waterfall of crystals on one side. Crystals wrap all around the cluster’s 20 foot circumference. An ultimate breath-taking museum piece, for a large display area with 360 degrees of visibility. Please inquire for the price of this multi-million dollar treasure.